Center for Literary Publishing, 9781885635532, 96pp. Selected by Tyrone Williams for the 2016 Colorado Prize for Poetry, Exit Theater casts classical elegy, with dazzling formal innovation, into a staggering work of contemporary, political polyphony. Through monologues, performance scripts, and poems of exquisite prosody, Mike Lala examines the human figure—as subject and object, enemy and ally—in the context of a progressively defigured and hostile world. Catullus, Shakespeare, Cy Twombly, and Lydia Delectorskaya echo across engagements with Israeli generals, accused terrorists, State Department employees, nuclear scientists, Saturday Night Live actors, war criminals, malware, and a host of mythic, literary, and half-extant spectral characters. Amid the cacophony, Lala implicates every actor, including himself, in a web of shared culpability vis-à-vis consumerism, representation, speaking, writing, and making art against the backdrop of the endless, open wars of a post–Cold War, post-2001 era. Exit Theater is a debut of and against its time—a book about war, art, and what it means to make art in a time of war. "This is a remarkable book—sprawling, generous, angry, delicate. Through borrowed language and staged dialogues, Exit Theater asks how individual experiences of violence combine with myth to create the collective present, where we peer out from the 'gun cabinet.' A gun cabinet is a scary place from which to act as friend, to act as lover, to talk to family ghosts. Lala’s book tears open the velvet cushioning." 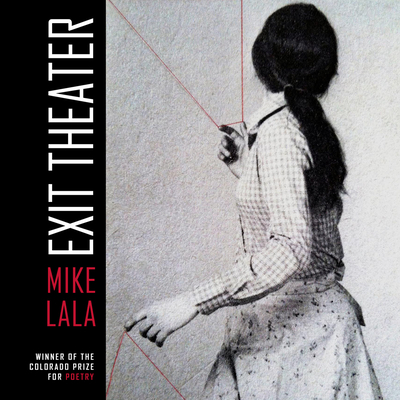 "Michael Lala’s Exit Theater deals mystery and suspense. This poet is expert at revealing the personal alongside the public through a language that’s intimate, searching, and uniquely his. The reader becomes an apt detective, ready to sift through imagistic and verbal evidence where the everyday and fantastic coexist. Exit Theater is indeed a challenging and seductive journey into an inner sanctum of reveries." "The whole book is a marvel of genre-straining performances, all of which complicate distinctions between reader and text. . . . Exit Theater raises our awareness of how we make meaning and dodge responsibility. It doesn’t read like an imperious indictment, but asks us to reexamine, along with the text, our assumptions about our surroundings." "Lala’s book manifests these cumulative senses of our time, the dull, buzzing inescapable ache that arises when the weapons have come off the stage and constitute the real. . . . [Exit Theater] ultimately stages a new question, perhaps an inevitable question, for aesthetic work in these times of violence: what happens when Chekhov’s gun becomes a drone, a melting ice cap, a toxic algae bloom?"